Abstract: Background: Type 2 Diabetes mellitus, as one of the most important chronic diseases in the world, threats patients’ quality of life. 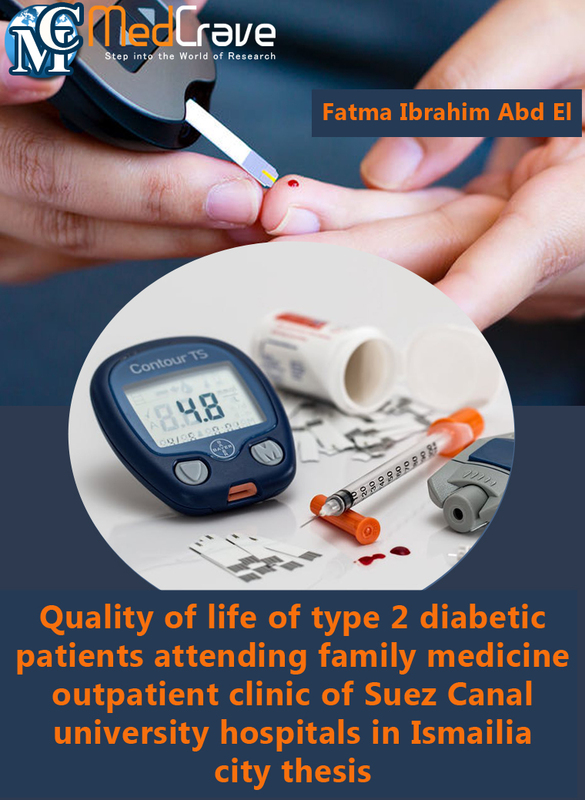 The aim of the study was to evaluate the quality of life of type 2 diabetic patients attending Family Medicine Outpatient Clinic of Suez Canal University Hospitals at Ismailia City. Subjects and Methods: A cross-sectional analytic study design was used. The study included 143 type 2 diabetic patients. World Health Organization Quality of Life Questionnaire abbreviated version was used to collect data regarding quality of life. Also, socio-economic data was collected by using socio-economic scale. Results: Revealed that less than half of the study group were rated as low quality of life in physical health domain while less than half of them were rated as high quality of life in social relationships domain. Factors related to lower quality of life in the present study were lower socio-economic status, poor glycemic control, obesity, physical inactivity and presence of diabetes complications as ophthalmological complications and diabetic foot ulcers. Conclusion: Type 2 diabetes mellitus has negatively affected all the quality of life domains of the study group. Creative Commons License Open Access by MedCrave Group is licensed under a Creative Commons Attribution 4.0 International License.